Posted by Yilan in western thrace. Turkish and Muslim population of Greece voted overwhelmingly for the radical-left group Syriza in Sunday’s elections and sent three deputies to the Greek Parliament from the Syriza cadres. Radical-left Syriza (Coalition of the Radical Left – Synaspismos Rizospastikis Aristeras) won Sunday’s elections in Greece by a great margin, and its leader Alexis Tsipras announced the new coalition in less than 24 hours. Along with many Greeks, who were frustrated with the economic crisis and EU-dictated austerity measures, many Turks and Muslim of Western Thrace also voted for Syriza. In Xanthi (İskeçe) and Rhodope (Rodop) provinces, in which Turkish and Muslim minorities makes up a significant portion of the population, Syriza won the elections by receiving 45 and 48 percent of the votes respectively, well above the national average of 36 percent. Hüseyin Zeybek from Xanthi (İskeçe) and, Mustafa Mustafa and Ayhan Karayusuf from Rhodopes (Rodop) provinces were elected as representatives of the Turkish community in the Greek Parliament. The Turkish community had also sent three deputies to the parliament in the 2012 elections. According to the results, Syriza’s votes are higher in rural areas where the Turkish and Muslim populations are the majority. However, in cities and towns, in which the Greeks form the majority, Syriza also received a higher percentage of votes than the national average. In Xanthi (İskeçe) province, Syriza received 45 percent of the votes. In the city of Xanthi, Syriza received 38 percent of the votes, meanwhile in Abdera municipality, its share increased to 42 percent. In Selero (Gökçeler) village of Abdera, Syriza’s votes were 74 percent. 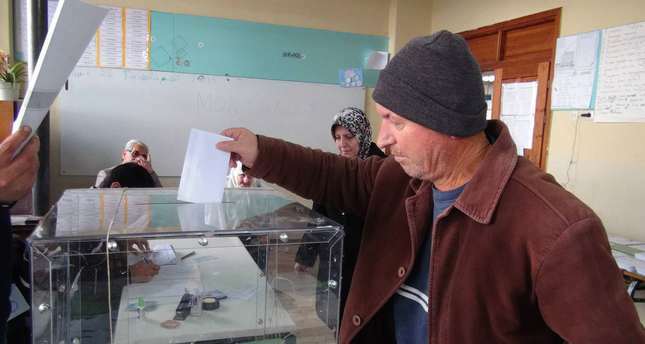 Again in Myki municipality, which is on the Bulgarian border and mainly inhabited by Muslim Pomaks, 69 percent of voters chose Syriza. The Thermes (Ilıca), Kotyli, Myki and Satres communities voted for Syriza respectively by 71, 68, 68 and 79 percent. In Rhodope (Rodop) province, Syriza received 48 percent of the votes. In the city of Komotini (Gümülcine), in which Turks make up 40 percent of the population, Syriza received 39 percent of the votes. The party won with 32 percent in Aigeiros (Kavaklı) and 46 percent of Neo Sidirochori (Cambaz) villages of Komotini. In Arriana municipality, 65 percent of voters chose Syriza. Organi, Kechros (Mehrikoz) and Fillyra (Sirkeli) communities voted for Syriza respectively by 64, 62 and 65 percent. Iasmos, Amaxades and Sostis (Susurköy) villages voted for Syriza respectively by 48, 72 and 71 in Iasmos municipality. Syriza received 46 percent of the votes in Maroneia-Sapes municipality, with 45 percent of the voters choosing Syriza in Sapes (Şapçı) village. Karayusuf spoke to German Deutsche Welle Turkish, and said that the Turkish community of Western Thrace have been affected worse than the rest of Greece in the economic crisis. “Minorities were affected more, as minorities have less government employees and most people are workers or peasants. Eight to ten thousand families make their living through tobacco cultivation. As the support from Europe decreased, these people started having rough times” Karayusuf said. He also noted that Western Thrace’s Turkish community was suppressed due to its identity, and Syriza was the only party with policies to preserve national identities.